A breezy 67 from Robin Uthappa, followed by a blitz from Shakib al Hasan has helped Kolkata thrash Chennai by eight wickets. Chasing a modest 155 runs for victory, Kolkata were off to a flying start. Robin Uthappa started off the proceedings in prime fashion stroking Ben Hilfenhaus for couple of boundaries. Uthappa, however was fortunate as he was dropped twice in his 39-ball knock. Shakib al Hasan provided the finishing touches with a fiery 26-ball unbeaten 46 as KKR cruised past the score with 12 balls to spare. 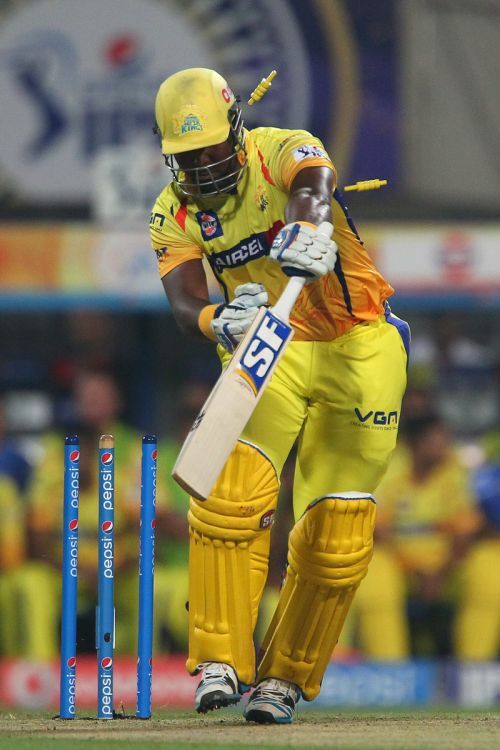 Pat Cummins playing his first IPL game, provided the ideal start as he castled in-form Dwayne Smith with a beauty. Smith looking to play the ball on and around middle stump was beaten by pace and swing, as the ball crashed on top of off stump, much to the delight of the bowler. Suresh Raina and Brendon McCullum, however counter-attacked KKR bowlers to get some momentum going. Things got a bit slow for Chennai as KKR bowlers pulled things back. Shakib al Hasan, though didn’t get any wickets, but managed to keep the scoring in check. 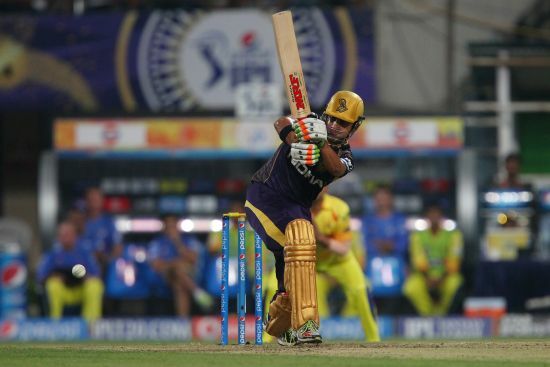 Chennai were largely dealing in singles in the middle overs as boundaries were completely dried up by KKR bowlers. 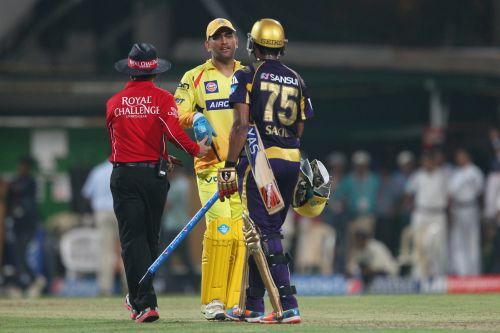 It was this pressure that resulted in wicket in the form of Brendon McCullum who was holed out in the deep by Surya Kumar Yadav off Sunil Narine. McCullum-Raina duo had put on a 55-runs stand for second wicket. Raina, meanwhile, continued his charge and he got an able partner in the form of Faf du Plessis. 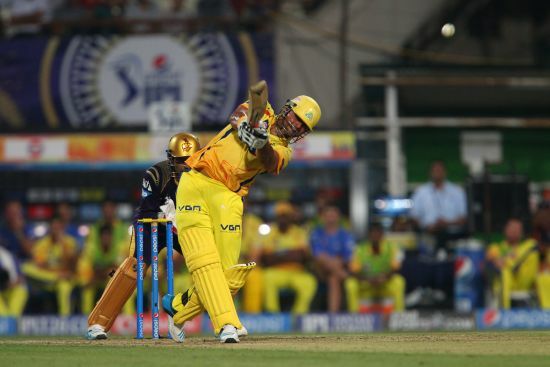 Raina took the attack to leg-spinner Piyush Chawla, hitting him for consecutive sixes and a boundary, which also brought up his half-century in 43 balls. Du Plessis at the other end attacked Shakib, but perished soon taking on a risky single. 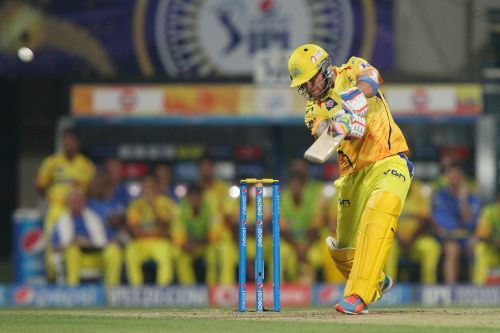 Raina too departed in search of some quick runs as Chennai innings lost momentum from there on. MS Dhoni and Ravindra Jadeja did use the long handle but wasn’t enough and had to be content with 154-4. Kolkata innings got off to a flier from the word go. Robin Uthappa the architect of the chase, made his intentions clear with a crisp extra-cover boundary off Ben Hilfenhaus. Hilfenhaus should have had Uthappa walking back couple of balls laer had Ashwin not spilled a sitter in the first slip. Uthappa added salt to injury with a clip off his pads. Ishwar Pandey was welcomed with consecutive boundaries, before Uthappa was dropped once again – this by Suresh Raina in the first slip. Gautam Gambhir, meanwhile, was quite happy to play the second fiddle, getting the single and giving the strike back to Uthappa. Pandey came in for some rough treamtement – this time from Gambhir as he southpaw hit consecutive boundaries off the pacer. Pandey however, had the last laugh as he castled Gambhir for 21. Uthappa continued his boundary hitting spree as he smoked one out of the park off R Ashwin. The right hander soon completed his half-century with boundary off Ravindra Jadeja off just 29 balls. Uthappa, was finally dismissed by Jadeja, while playing one shot too many. Shakib al Hasan came in and looked aggressive from the word go. With Manish Pandey struggling with his form, Shakib hit Jadeja for a massive six. Shakib took the game away from Chennai in the 17th over, when he punished Hilfenhaus with a six and followed it with consecutive boundaries. The Bangladeshi all-rounder finished the game off with a boundary.